At this point in the game, it's really tough to say that the BlackBerry Bold 9650 isn't for real; especially with all the leaks surrounding it. Even though neither RIM or Verizon has gone on to officially admit to the existence of the handset, it was meticulously outed, possible by accident, thanks to the recent launch of the NFL Mobile application. 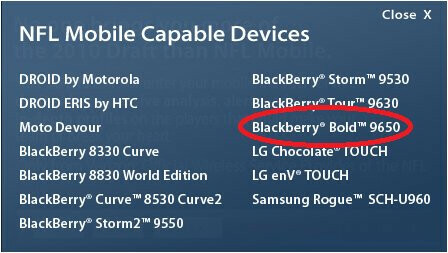 On the web site, there is a listing of compatible devices that are expected to be able to run the app – but taking a quick peek, the BlackBerry Bold 9650 is surely standing out for everyone to see. It could be that someone didn't double check ahead of time which current devices were available, but now it just unofficially confirms the reality of the device. I didn't realize anyone doubted it's existance.